Hearing that Lazarus was dead, Jesus wept and prayed. 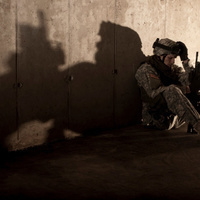 In an age of endless war, we too, in tears, must "pray always." It is one thing to go dark in death, and another to go dark in life. Among the casualites of war are those killed from the inside out: visibly unscathed, invisibly haunted. Any nation sending its daughters and sons into the valley of death must learn to call them back, body and soul, to the land of the living. Robert Emmet Meagher is professor of humanities at Hampshire College (Amherst, MA) and the author of numerous books, including Killing from the Inside Out: Moral Injury and Just War.